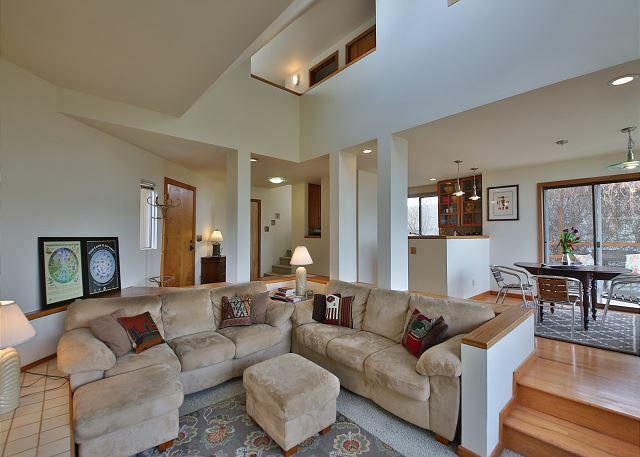 Penn Cove is across the street from this perfect architect-designed Coupeville home. Two bedrooms, 1.5 bathrooms. A short two minute walk to downtown restaurants and shops, a pier for kayak launch, and a walk along the beach. 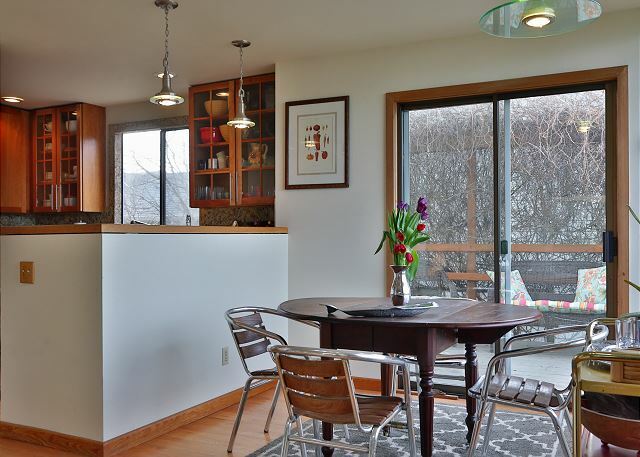 Central to everything on Whidbey Island, this home will provide the perfect stay for relaxation or adventure. The pictures are worth a thousand words! Enjoy discovering this Hidden Gem. Ask us about our off-season "weekday wine special". 4 NIGHT MINIMUM JULY AND AUGUST. 2 DOG MAXIMUM. house was clean,amenities in kitchen above par. View was fantastic, only small thing is the view would be awesome if they took out the huge plant in front of living room window. Saw deer everyday as well as whales and easily walked to town. Thank you for your comments. We are so happy you enjoyed your stay on Whidbey Island and had a "Coupville Experience". He hope to help you with your next stay. Great location, walking to the beach was fun for the kids. Nice we could take our dog. Very clean and plenty of blankets, towels etc. Thank you for your comments. We are so happy that you found the "perfect getaway" on Whdibey Island. We hope we can help you with your next stay on the Island. Was more roomy inside than expected. Clean and comfortable. Nice location across the street from a park on the water. Thank you for your comments. We are happy you enjoyed your stay on Whdibey Island and hope we cn help you with your nex stay. Beautiful place to get away in style!!! This place is beautiful and beyond a perfect place for a get away. 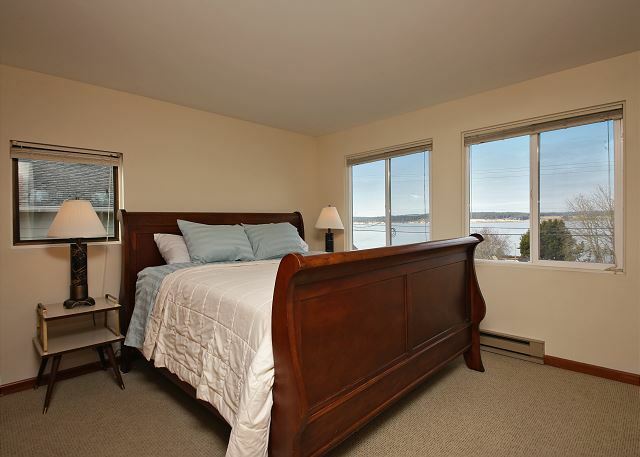 Has all of the amenities of home and is directly across the street from the water. Thank you for your comments. 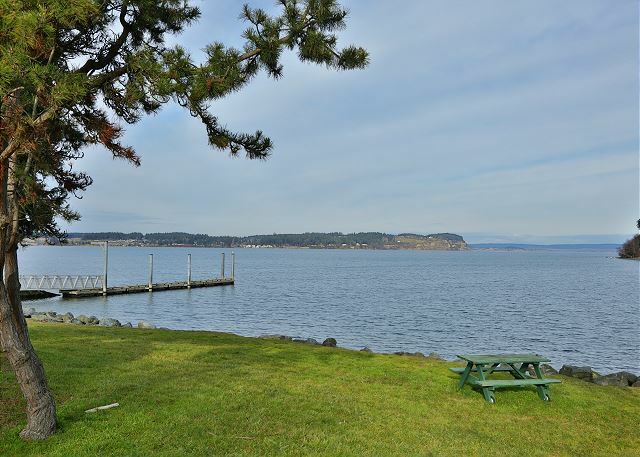 WE are happy you found the home you stayed in "beautiful" and enjoyed your stay on Whidbey Island. We hope to help you with your next stay on the Island. This is the most elegant, well put together, comfortable home that I have experienced. Everything and I mean everything you need is there. This rental is perfectly and fairly priced. The people at tara rentals are wonderful! They all pretty much held my hand through the whole process of set up. I cannot wait to go back and stay at this exact house. It was exactly the weekend my husband and I needed. Thank you all for making our experience so wonderful! Thank you for your comments. We are so grateful you found your stay "exactly" what you "needed" We hope we can help you with your next stay on Whidbey Island. Walking distance from downtown Coupeville is a plus, but the home is dated well used and could stand a lighting update along with some firmer mattresses and a shower head that doesn't spray water everywhere except on the person in the shower! Management company obviously keeps an arm's length relationship with this home - shame because it's well stocked and in a great location. Overall a wonderful experience! We wanted to walk to town and explore Fort Casey and nearby beaches. Perfect for that. Ciao restaurant just a few blocks over was amazing!! Thank you for your comments. We are happy you had "a wonderful experience on Whidbey Island. We will pass along your suggestion, thank you. We hope we can help you with your next stay on the Island. The place was perfect for us. A good size and location. Very well equipped. We did find the beds exceedingly soft - softer than any bed I'd ever seen. As a result they weren't that comfortable. Having said that, I would still highly recommend the property. Thank you for your comments. We are so happy "the place was perfect" for you. We can't wait to help you with your next stay on Whdbey Island. Nice place great view. Only problem was treatment plant across street. More noise than smell. Close walk to downtown. Thank you for your comments. We are happy you "loved the view" and the "walk to downtown" was close for you. We hope to help you with your next stay on the Island. Thank you for the "great' comment. We are happy with the survey you gave us and hope we can help you with your next stay on Whdibey Island. We were visiting Whidbey Island for my sister's wedding and this Hidden Gem was perfect! My sister lived in Oak Harbor and the wedding was in Coupeville so she actually used our rental to get ready on her big day. The home is beautiful, but also felt like a home - not a shrine. This made everyone who visited us while we were there comment on the comfort of the home. We especially loved all of the memorabilia, the books, and the reading nook. We were very comfortable and our dogs loved the home, as well. They especially liked the walk across the street to the park, as did we. Other reviews mentioned a stale, stuffy, odor, so I was a little hesitant, but we didn't notice this at all. Quite the opposite. The home felt fresh and airy and we loved the sea breeze on the deck. We will definitely stay here on our next trip! Thank you for your comments. We are so happy you had such a "perfect" stay on Whidbey Island. We hope to help you with your next stay on the Island. Great location and a great home - highly recommend! Thank you for your comments. We hope we can help you with your next stay on the Island. Really enjoyed the house! Everything we needed was nicely provided. Great kitchen and views. Tara Property Management was very helpful and responded to all of my needs and requests. Thank you! Thanks for your review. Glad to hear you had a great time on Whidbey Island. It was a terrific location and the layout of the house was wonderful. The towels, sheets and surface were all clean, but it really does need a good deep cleaning. It did not smell good when we checked in and airing it out was never really enough to eliminate the poor aroma. Otherwise I would have given it a 5 star rating. Thank you for your review. We are happy to hear you loved this home. We will speak with housekeeping regarding the deep cleaning. Wow, what a beautiful place to begin our new life together! Amazing home that was clean, well-stocked, and gorgeous water views. Thank you for your comments. We are happy that you had a "beautiful place" and an enjoyable time on Whidbey Island. We hope that you will come back and enjoy your next stay. We loved the rental and overall experience. The house was warm and cozy and fully stocked with everything we needed (except for measuring spoons!). We were looking for a quiet and relaxing weekend, which is exactly what we had. The view was great to watch some fireworks across the water. The little beach across the street was perfect for walks and our dog loved it as well. Thank you! Thank you for your comments. We are happy you "loved" your "experience" on Whidbey Island. 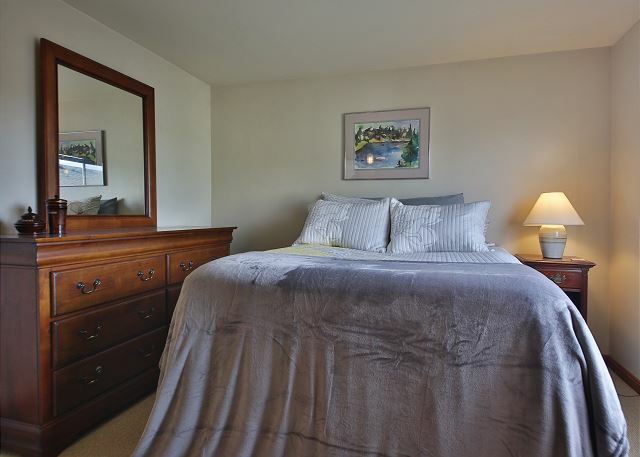 We hope to help you with your next "perfect" stay on Whidbey Island. This was just what we were looking for! Good location and view, lots of light, and clean. Thank you for your comments. We are happy you stay was "just what you were looking for", we hope we can help you with your next stay on Whidbey Island. We enjoyed this two bedroom home. The description and photos are accurate, and you can see the sound as you look out the windows. 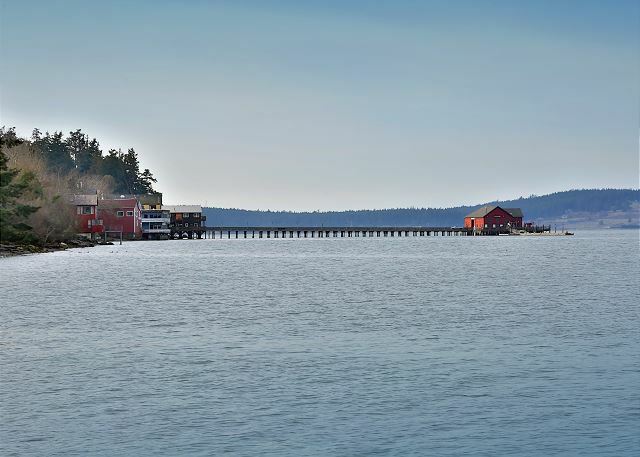 Coupeville has a charming and historic downtown, and we would love to come back one day. Thank you for you comments. We are glad you "enjoyed" your stay on Whidbey Island, we hope to help you with your next stay on the Island. This was our second time staying here and loved it even more than the first time. The location is perfect for walking to town or wherever our adventures take us. We loved our deer visitors that would come right up to the front window and look at us. Can't wait to come back. Thank you for your comments. It's always great to find a place you "love' to stay at and you find "perfect" for you needs. Thank you for letting us help you not once but twice on Whidbey Island, hope to see you soonn. House was very clean and very nice. Location was great. Close to the places we wished to visit. Construction next door so we did not use the outside space. Beds were very soft to the point of discomfort. Thank you for your comments. We are happy that the location you selected met your needs for staying on the Island and have brought your concerns to the attention of the owner of the property. We hoped to help you with your next stay on Whidbey island. We were on Whidbey for a wedding. We loved the sunken living room. Perfect for conversation during our family visiting time. Beautiful view across the water from the dining table. Appreciated the prompt replies from the office when I had questions prior to our arrival. Family members who were staying at other places, said they wished they had booked this house! Thank you for your comments. We are happy you "loved" the home you chose and it was 'perfect" for family conversation. We hope we can help you with your next stay on Whidbey island. Prompt response given to an issue with a slow drain. Occasional odor from the nearby sewage treatment facility experienced when using the patio. 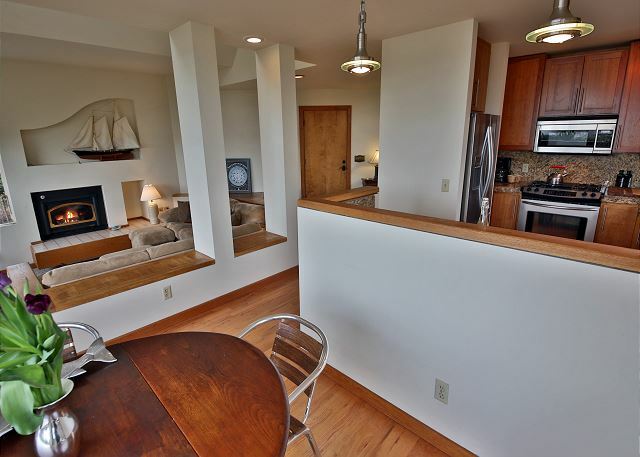 Overall a clean, well equipped rental with a very nice view of the cove. Thank you for your comments. We are happy you enjoyed the "nice view of the cove". We hope we can help you with your next vacation on Whidbey Island. 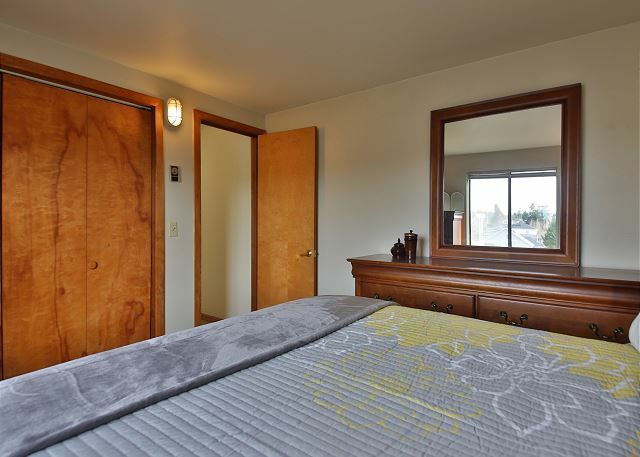 We have stayed on Whidbey a couple of times, and rented several VRBO's , as far as location- it was very convenient, great kitchen, living room was perfect, beds were great.. The outside of the house was a bit disappointing, not because of location but because the landscaping was less than desirable, the shrubs and trees were unkept and kept us from enjoying our outdoor view. 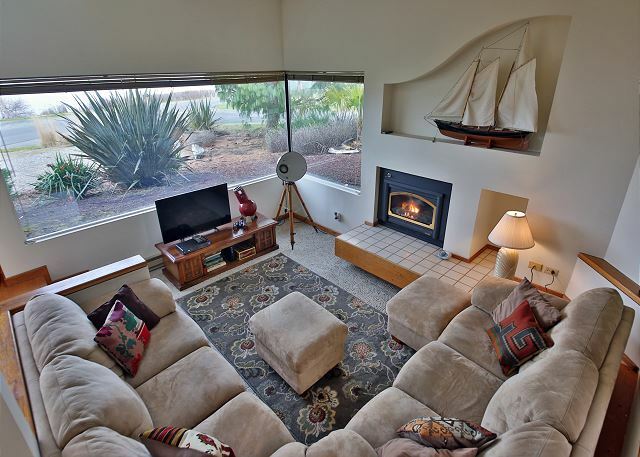 The deck was unswept and weeds all over the cement pad where there was a cute fireplace. I had read the review about the dining table chairs being uncomfortable and I had hoped it was an exaggeration. It was not.... They are the most uncomfortable chairs I have ever sat in... Suggestion- buy new chairs. BTW I did pull the weeds that I could from the patio. Thank you for your review and feedback! We are so sorry about the weeds and will forward the feedback to the owner about the landscaping and the chairs. It was very kind of you to pull some weeds and we are sorry you had to do that! and ironing board. I would definitely return here. We are so glad that you enjoyed your stay! Thank you so much for your review! It looks like you may have meant put put down all &quot;5&quot;s instead of all &quot;1&quot;s. Hopefully you found everything satisfactory! Property is at a very lovely location - view and access to beach make the place very enjoyable. Yes the water treatment plant is there but not really an issue. The home is adequately stocked with most items to prepare meals and the BBQ is an excellent addition. The views are amazing and it is a quaint and quiet neighborhood. The walk to Front Street for cinnamon rolls, lunch or shopping is enjoyable. A store on Main Street is a great place for groceries but if you need more, Oak Harbor is 15 minutes away! The accommodations are nice and comfy. You can easily settle in to such an enjoyable atmosphere! It would be nice if there were curtains on the windows for privacy and to block the morning "bright" sun in the front bedroom and renters should be aware that not only is the front bedroom open to the downstairs but the skylights also make the room quite bright in the morning. There are blinds on the windows but privacy and lighting are still an issue. Also, the landscape is kind of a disappointment. Needs to be cleaned up and the clippings from the last effort were left laying around - Such a nice place but the outside needs attention. The seating on the back porch was wonderful especially with the breeze. That was a favorite place - nice seating out there. All in all we very much enjoyed the location and many of the amenities offered. We would hope to stay again! Thank you for your comments. We are happy that your stay was enjoyable on Whidbey Island. We have forwarded your comments to the owner, thank you for your feed back. The mattress was too soft and caused us both back pain due to the lack of support.The outdoor chairs provided in the dining room were hard, had no lumbar support, and my spouse could not sit through a meal on them since her back was already sore from the mattress. The property is well located, has a beautiful view, it was clean, well stocked, and we enjoyed the BBQ very much. We are so sorry to hear that the mattress and the outdoor chairs were not conducive to your backs. We are, however, very glad to hear that you still enjoyed the location, the view, and the amenities. Thank you for your review! This was a lovely well maintained very clean home with a great location across a quiet road from a nice waterfront park. Everything you would need is there and tara property management couldnt have been nicer to deal with. I am sure you wont be disappointed and it is located in what we thought was the best area of the island for a vacation..Coupeville. Dont miss out on the cute shops there! Nice to hear you loved this home. 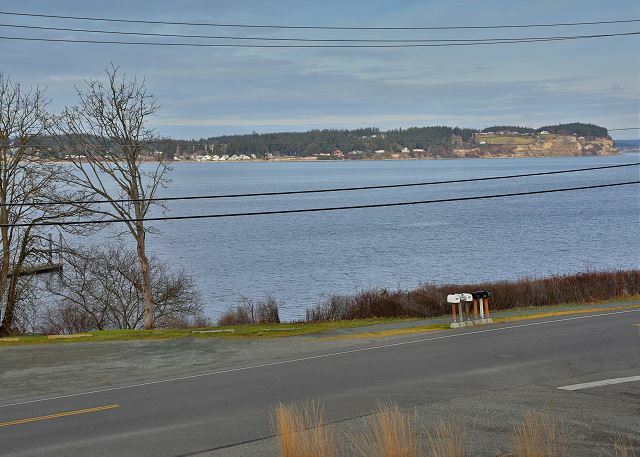 We're happy you got to enjoy the island and Coupeville. Thanks for your review. Hidden Gem hid some details. House was clean, had everything that was stated and the kitchen had all the cookware, utensils, etc. to make any meal we wanted. Main bedroom was open to the rest of the house, with a partial wall overlooking the downstairs, not very private. Hot water tank was either very small or needs replacement. Showers had to be quick and definitely not while washer or dish washer was running. There is beach access along with a pier to launch kayaks as stated, however, it was not mentioned that the sewer treatment plant was also right across the street. Would catch a whiff of smells that weren't that pleasant. Exterior landscaping needs help. Gravel "yard" in front needs grass so that outdoor activities like volleyball, croquet, badminton, etc. could take place on property. Thank you for your helpful comments! We're glad that the amenities in the kitchen met your needs. We do have a picture of this bedroom on our website, but even then it's difficult to get a good idea of what it's like in real life. Your comments will be very helpful to our future guests, so thank you for mentioning the bedroom layout. 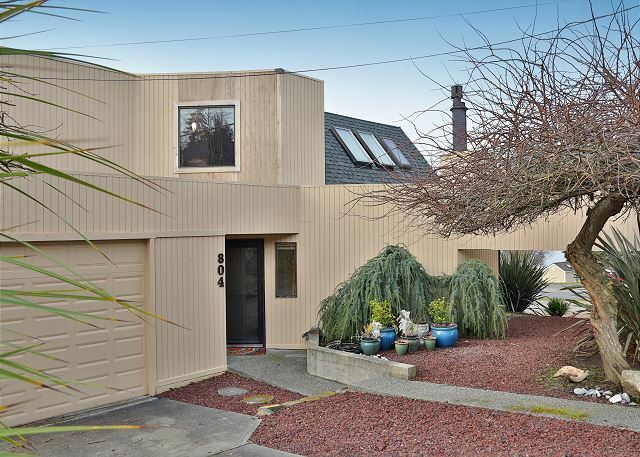 This house is built to accommodate four guests and six with owner approval, so if your party stayed within that maximum occupancy limit, there shouldn't have been any hot water issues. If you were in that range and still experienced issues, we apologize. The owner is aware, and if we continue to face problems, we'll see what we can do to take care of that. We're sorry that the sewer treatment plant created unpleasant odors during your stay. This is the first we've heard of this problem, so hopefully it's a rare occurrence at this location. As for the exterior landscaping, it is well taken care of and the gravel yard is the artistic choice of the owner. Thanks again for your review! We hope you'll come stay with us again! Thank you so much for your review! We're so glad that you had a great weekend and that you enjoyed the home and the location. Thanks for your recommendation, we'll run it by the owner and come up with a solution. Hope to hear from you again! We're so glad you enjoyed the property and location regardless of the weather! We look forward to you staying with us again. Thanks for your review! We were lucky enough to be the first people to stay here. We loved it. The location was perfect for walking to town and watching all the wild life right out the window. We're so glad that you enjoyed the property and your stay. We hope you'll stay with us again! Thanks for your review!